This entry was posted on January 28, 2019 at 11:42 am and is filed under Crosswords with tags Colin Gumbrell, Crossword, D.S. MacNutt, Derrick Somerset MacNutt, Everyman Crossword 3772. You can follow any responses to this entry through the RSS 2.0 feed. You can leave a response, or trackback from your own site. 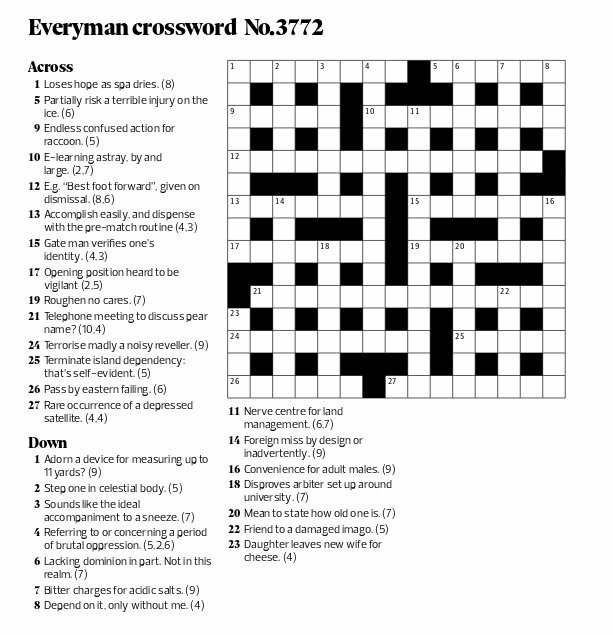 When I came back to cryptic crosswords again recently after a long hiatus, I started doing the daily puzzles in the Guardian. These are a pretty good match to my skill level. I can almost always complete them, although there are often a few clues I can’t completely parse. (www.fifteensquared.net is a great resource in these cases, by the way.) Guardian daily puzzles are quite heterogeneous in both style and difficulty, because there are many different setters. After seeing your description of this puzzle, I went and did it and also went back to try some previous Everymans. The previous ones are excellent and at a good level of difficulty for me. I think I’ll go through a number of past puzzles from the Everyman archive. Colin Gumbrell took over as Everyman setter in 2014 or thereabouts, and I think his puzzles are a little bit harder than the previous ones. You have plenty to have a go at if you go through the last five years! I’ve never understood why English-languge cryptic crosswords have indicators. Isn’t it more interesting without them? Quite right too. So which ones will you be wasting your time on henceforth? I don’t know. I’m always disappointed that the arXiv doesn’t have a crossword section. I agree. 15a is another anagram with no indicator. Perhaps the new setter thinks rules are there to be broken? Have you done the new Everyman? I’d love to hear your opinion. I thought it was much better than last week’s. I don’t recall any clues that are completely broken in the style of the previous puzzle. I did find quite a few clues that were a bit loose with the “rules” of cryptic clues as I understand them: either the definition wasn’t quite accurate, or the cryptic grammar wasn’t quite right. If I saw any one of those clues in a daily puzzle in the Guardian, I might raise an eyebrow, but I wouldn’t think there was anything seriously wrong. In fact, giving the setter a bit of leeway allows more room for the sort of playful deception that makes cryptic crosswords enjoyable (although to my mind the most satisfying clues are the ones that achieve playful deception while strictly adhering to those rules). But the density of such slightly dodgy clues seemed a bit high to me. Yes, it’s certainly better than last week (which isn’t difficult), but not really up to Colin’s standard. Still, if it’s a new setter we should give her/him the chance to settle in. I’m told that last week’s was a last-minute stop-gap, while this is by a proper replacement. That sounds reasonable to me. I read somewhere (probably on the fifteensquared blog, which I find very useful) that there was a lot of grumbling when Colin Gumbrell started. His crosswords were very easy to start with, rather like the simpler Guardian setters (Rufus, Janus, etc). I actually did the Guardian Prize cryptic yesterday. That was quite fun, but also quite easy. I agree about the recent standard: the clues have been frustratingly imprecise: poor definitions and/or indicators, and an over-use of solutions embedded in the clue, but above all they aren’t entertaining: ponderous and over-literal: none of the sparkling wit of the predecessor. One should know, and hopefully gasp with amusement, when one has cracked a clue! However, I do note that the February 24 crossword was much more in the style of the old ones: is this another compiler, or has the former one returned? Perhaps the Observer have got the message. It’s a new compiler, I think.